Lovingly made with homegrown Organic Spearmint, Organic Peppermint, Organic Cocoa Butter and local Beeswax. Perfectly blended without harsh essential oils, this lip balm was created to soothe and protect lips. Mints are proven antiseptics, which means severely chapped lips are protected from infection and given time and nourishment to heal. The mint crowds the backwall which is fine with me! 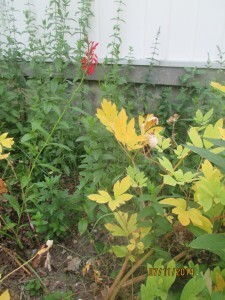 In this pic we see the time of year of when the bleeding heart is fading and the Cardinal Lobelia takes it’s place as the star in that part of the garden.